Alabama Sunset' is a popular and durable sun-tolerant coleus. This coleus is on my friends back deck. She knows – because I just had to tell her — that coleus should be pinched back. I admit this trailing plant is very pretty and continuously blooming. Most long time gardeners would have rushed to this plant and made 2 dozen cuttings imediately. It just occurred to me when I saw this plant, that we don’t have to follow the rules or even an experienced gardeners advice. Relax. Be happy. It is OK to NOT follow the rules all the time. You don’t Have To pinch plants. If you don’t, this is what will happen.↑ (see above photo) That’s OK too. I watered the container but did not fertilize it. The bidens is self cleaning, takes full sun or part sun and looks good in this combination. Alligator tears doesn’t need constant pinching and looked full, not leggy in the pot. It was my honor to trial these plants for Proven Winners last summer. Proven Winners are easy to find in our area. You could imagine my shock when I read the back of the plant label this spring: “BUY THIS! Even Patsy Bell Hobson did not kill it.” I don’t know if this is a regional marketing stategy or a National Campaign. Let me know if you see this tag in your store. 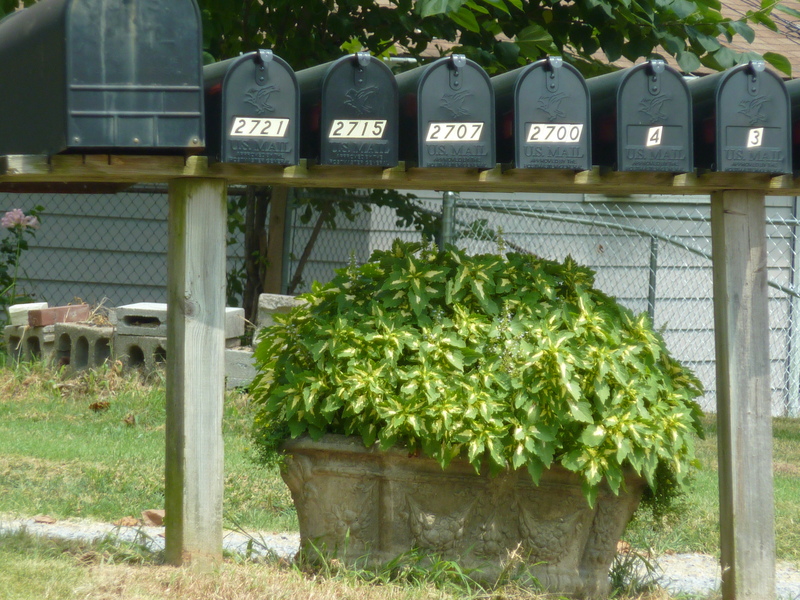 I planted three pots of Alligator tears in the planter under the mail box last summer. The hose rarely made it out that far. I did not add fertilizer. Both plants, bidens and the coleus, performed all summer. I combined these two coleus in hanging baskets that had late afternoon shade. Generally these plants were left on their own. I cut them back only twice during the growing season. Red Head is truest red color in the Ball coleus collection. I like these newer coleus that can take the heat and hold their henna color in both full sun and part shade. The Versa Coleus series includes Crimson Gold. 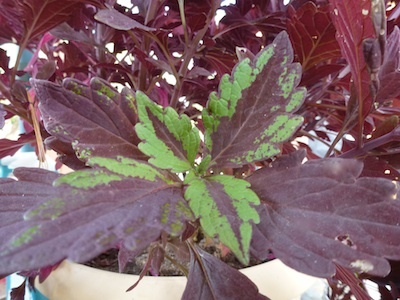 These coleus were neglected, not fertilized, and inconsistently watered in hanging baskets. The bicolor leaves held their color, were vigorous, and quickly branched into a full mounded hanging basket. 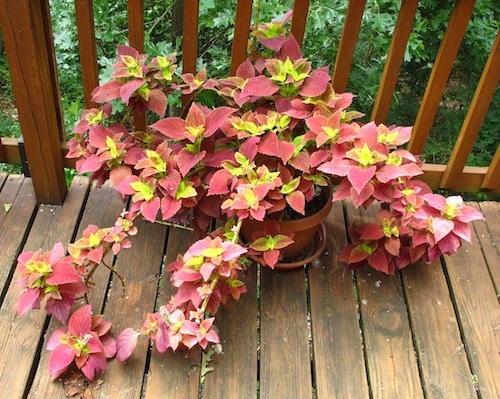 All coleus will be gone with the first freeze, but till then, these plants provide bright, bold color on the patio. I’ll be using more coleus in my gardens because, unlike flowers, you get bold, season-long color. If I can get bright , fade proof red in my garden all summer, I am inclined to plant it again next year. Most folks look at a garden at a distance. They just see the red. And this Ball Horticultural trial plant is a long lasting, fade proof busrt of red in my garden from spring till frost. Look for it next spring. Most of my trial plants went in containers like this. Coleus gave my garden bright season-long color. ColorBlaze® Alligator Tears™ Solenostemon scutellarioides Coleus is growing in three different place in the garden. I am attracted to the multi color coleus in reds and greens, so Alligator Tears had to win me over, and it did. It requires less trimming to maintain it’s thick, full shape than most coleus. This was one of the easiest, to care for containers on my patio. In fact, I have a pair of these containers. 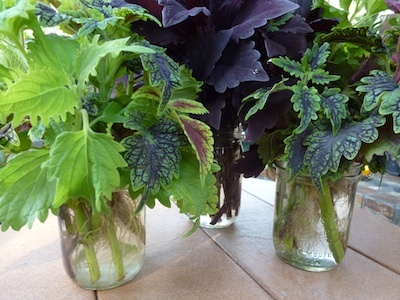 One container with two coleus and one Bidens, and another with one coleus and two Bidens. 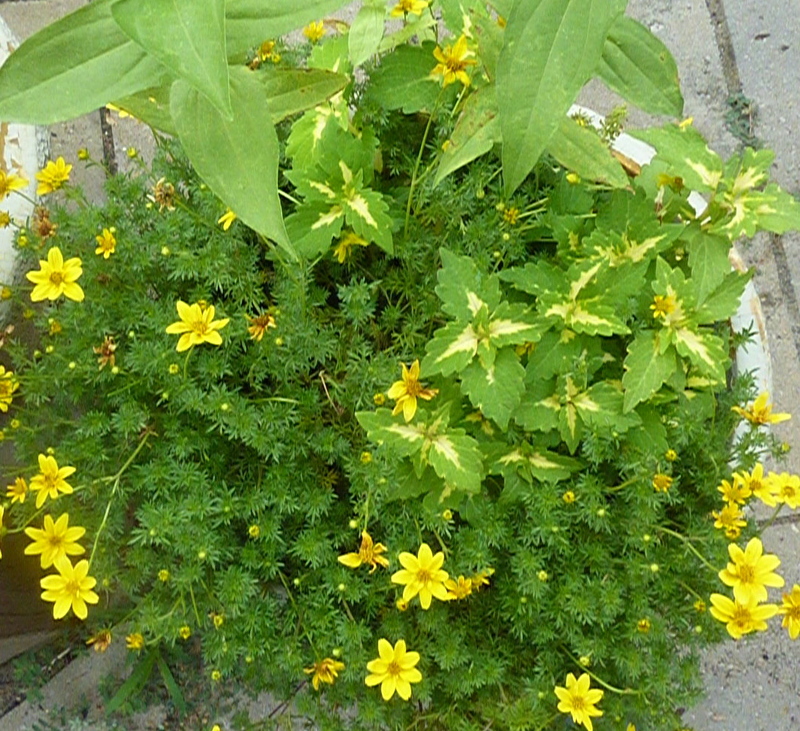 Golidilocks Rocks™ – Bidens Ferulifolia is loaded with bright yellow blooms and has bloomed continously all summer. It has grown in containers with little care or attention. Goldilocks is a great choice for containers, withstood our record-breaking heat and has blended into a delightful container combination. This self cleaning trait – meaning no deadheading necessary – is another reason to include Golidilocks Rocks™ in container garden combinations. Only two coleus in the concrete planter, they looked kind of lonely when they were first planted. Out by the mail boxes, these Aligator Tears recieved no pruning or cutting back. They did not set seed until mid August. They nicely fill the container and kept a good shape. Imagine how well they would do with pinching back, generous water and fertilzer. These plants were sent to me for trial and evaluation. Thanks to Proven Winners for the opportunity to grow the newest most exciting plants. For plant combinations and container ideas, go to Proven Winners. Coralberry Punch Calibrachoa is a Superbells® Proven Winners Calibrachoa hybrid paired with Coleus Redhead a Ball Exclusive and a Simply Beautiful® selection. These two plants seem to bring out the best of red in each other. Colors do not fade and they are very drought tolerant. Most coleus need regular pinching or pruning to keep it’s bushy shape, but I rarely trimmed or fed this combo. The Coleus Redhead, is a Ball Exclusive. It’s hard to find a fade resitant coleus this color. I will look for the Redhead next spring and add it to my hanging baskets or containers. Calibrachoas are a new type of plant that looks like a dwarf Petunia. These little flowers bloomed all summer, the containers are in full sun, and got irreglar watering. Great container choice for this drought tolerant plant that showed no sign of disease or insect damage. Look for more varieties of this fade resitant full sun bloomer at Proven Winners. There are some great color combinations on Proven Winners site.